The system boards are completely equipped experimental and development boards. They are designed for entry into the microcontroller programming or rather user-specific developments. Using standard Add-On sockets allows the system board to be extended with add-ons and modules. Via USB interface are the PC and the programmer able to communicate over different protocolls (myMode, AVR910/911, STK500) with each other. Here can various programming methods be used, e.g. ISP, High Voltage parallel, High Voltage serial and TPI. 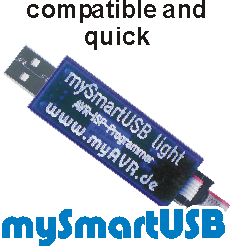 Selected programmer can be used as a USB to UART Bridge and establish a serial connection from the PC to the target system. The myEthernet with the ATmega644P! 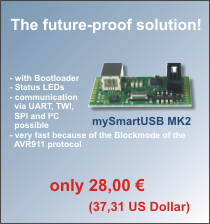 USB interface with "mySmartUSB MK2"